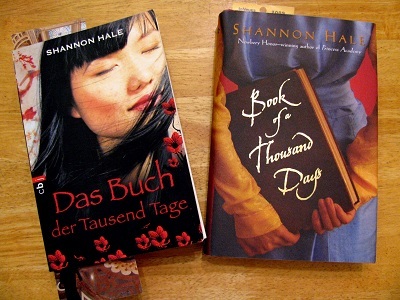 This week, I’ll be going back to one of my favorite young adult novels, Book of a Thousand Days, by Shannon Hale, known as Das Buch der Tausend Tage in German. It’s actually been three years since we did a Sonderling Sunday in this book! (This is far, far, too long — more than a thousand days!) We’re “Later” on Day 223, which is page 72 in the English edition, Seite 82 auf Deutsch. The first sentence of this section is a good place to start. = Draußen ist großer Radau. = Warum tanzt dieser Lärm wie Fingernägel über meinen Rücken? = Es klingt wie ein Albtraum. = Kein Geräusch von den Wachen. = Die Ratten jagen quiekend um sie herum und ich höre ihre Lippen schmatzen, schmatzen, schmatzen. Und noch eine schlechte Neuigkeit: That’s all for tonight! In honor of Memorial Day weekend and having already finished reading 5 books this weekend and written 3 reviews, let’s do a short, late night Sonderling Sunday! Sonderling Sunday is that time of the week when I play with language by looking at the German translation of children’s books. 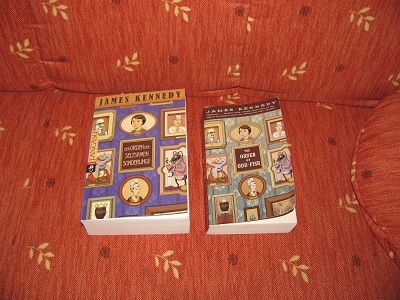 It’s been awhile since my last Sonderling Sunday post, and I’m getting so very close (proportionately) to the end of the most Sonder-book of all, that we’re going to stick with Der Orden der Seltsamen Sonderlinge, The Order of Odd-Fish, by James Kennedy, again this time. = Jo betrachtete die Decke, während eine weitere schlaflose Nacht sich dahinschleppte. This one’s interesting. “Flurd-Poffle” is translated Bodenhatz which means something like “ground-hunt.” It’s another made-up word, but why was it translated at all? = Wohin auch immer er ging, er verzerrte alles um sich herum zu einem hohlen Witz. That’s all for tonight. It’s fun now to imagine scenarios where you could possibly use these new German words you know. 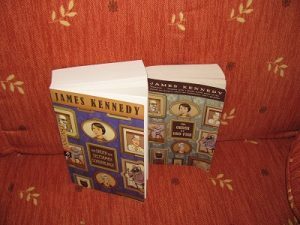 Tonight I’m going back to the especially Sonder-book, Der Orden der Seltsamen Sonderlinge, which is the translation of The Order of Odd-fish, by James Kennedy. Last time, I left off in the middle of Chapter 23, page 314, in English, Seite 399 auf Deutsch. = Die Sonne versank hinter den Bäumen und es wurde dunkel, aber das Fest ging weiter. “Stroke him, reassure him.” = Streichelt ihn, beruhigt ihn. = Jetzt sind Sie aber wirklich albern. And you thought we’d never learn how to say this! dass es schwer zu glauben war, diese Musik würde aus Grunzen, Schnauben, Fürzen und Rülpsern eines gigantischen Wurms bestehen. See what they’ve done? Although when Sir Alasdair began playing the Urk-Ack by climbing inside it and pinching its organs at first all that came out was farts and burps. Now he has progressed and is giving a lovely concert – but the translator put the farts and burps back in! Oops! = Das ist mein Augenblick des Triumphes! “The audience was booing.” = Die Zuschauer buhten. = Ich erwarte, dass Sie alle meine Probleme lösen! And that brings us to the end of Chapter 23! I think it’s fun how little these phrases give away the plot – I hope they tantalize the reader to want to know the details! I am getting close to the end! And I got to thinking that it would be really nice to finish looking at this book before I start my real work of reading for the 2019 Newbery committee (reading books published in 2018). Because I fear I won’t have a lot of time for Sonderling Sunday once that happens. So – let’s push on! Last time, I finished Chapter 22. Let’s look at what the next chapter holds, beginning on page 309 in the English edition, Seite 393 in the German edition. = Der Regen hörte so plötzlich auf, als hätte jemand ihn abgeschaltet. And I’ll stop at the end of that section, as they’re going to the festival. Now, may you enjoy the Marschkappellen und blendende fireworks on the fourth of July! 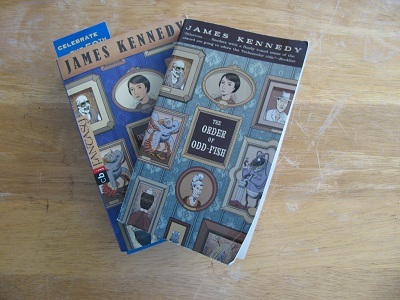 Tonight we’re back to the most Sonder book of them all, Der Orden der Seltsamen Sonderlinge, which is the translation of The Order of Odd-fish, by James Kennedy. Last time, I did a short post, beginning Chapter 22 with Jo getting ready for Desolation Day. I do my best not to post any spoilers, but I do hope readers of my blog will be intrigued to ask What sort of book would use these fascinating phrases? Pick up a copy! “The night before Desolation Day, Jo, Ian, and Nora huddled from the rain under an awning in East Squeamings, waiting to be picked up by the Wormbeards. = Am Vorabend des Tages der Verwüstung drängten sich Jo, Ian und Nora unter eine Markise in Ost-Heikel, wo sie darauf warteten, von den Wurmbärten abgeholt zu werden. = Fionas Atelier war ein großer Betonbunker, in dem es nach Gips, Lehm und Farbe roch. That’s all for tonight! I got eine stille Befriedigung from doing Sonderling Sunday again! It’s time for Sonderling Sunday! That time of the week when I play with language by looking at German translations of children’s books. 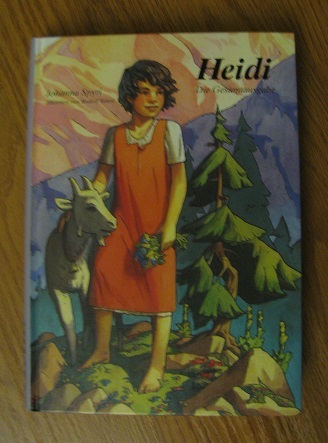 Today, in honor of Easter Sunday, I’m going to choose Chapter 14 of Heidi, by Johanna Spyri, where Heidi’s grandfather goes back to church. Heidi makes a plan to buy fresh, soft rolls for the grandmother every day. O juhe! Nun muss die Grossmutter gar nie mehr hartes, schwarzes Brot essen, und, o Grossvater, nun ist doch alles so schön, wie noch gar nie, seit wir leben! und Heidi hüpfte hoch auf an der Hand des Grossvaters und jauchzte in die Luft hinauf wie die fröhlichen Vogel des Himmels. Okay, forgive me but I love this next paragraph. Here it is translated into English. O wenn nur der liebe Gott gleich auf der Stelle getan hätte, was ich so stark erbetete, dann wäre doch alles nicht so geworden, ich wäre nur gleich wiederheimgekommen und hätte der Grossmutter nur wenige Brötchen gebracht und hätte ihr nicht vorlesen können, was ihr wohl macht; aber der liebe Gott hatte schon alles ausgedacht, so viel schöner, schöner, als ich es wusste; die Grossmama hat es mir gesagt, und nun ist alles so gekommen. O wie bin ich froh, dass der liebe Gott nicht nachgab, als ich bat und jammerte! Aber jetzt will ich immer so beten, wie die Grossmama sagte, und dem lieben Gott immer danken, und wenn er etwas nicht tut, das ich erbete, dann will ich gleich denken: es geht gewiss wieder wie in Frankfurt, der liebe Gott denkt etwas viel Besseres aus. You know what? I like that so much, and it so beautifully sums up what I’ve been thinking about my own life as I write Project 52 – I’m just going to stop there. You are currently browsing the archives for the Sonderling Sunday category.